* John Gaadi, the backup goalkeeper, is born 03.03.1982 according to FIFA, not 03.03.1986 as stated at MTN Football. Gaadi was FIFA-registered when he was part of the FIFA Beach Soccer World Cup in 2009. * Abiodun Kayode, the powerful winger, is born 11.06.1988 according to MTN Football. I believe this is a mistake. According to several other sources, Kayode is a teenager. The excellent website Voice of the Player specifies his birthdate to 06.11.1992, which I find more trustworthy. * I recently found out that I have wrongfully “merged” two players: Tijani Adamu of Sunshine Stars FC and Tijani Adamu of Gombe United FC. These are actually two different players. Tijani Adamu of Gombe United FC, a central defender, is still part of the Desert Scorpions and is a former member of the Nigeria B national football team. 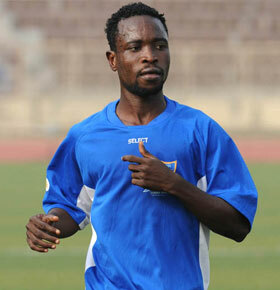 Tijani Adamu of Sunshine Stars FC is apparently an attacking midfielder, born 03.10.1992 according to MTN Football. * Sunshine Stars FC has three former players of Gateway FC – top scorer Ajani Ibrahim, goalkeeper Henry Ayodele and central defender Onyi Chiemeka. According the former webpage of Gateway FC, now deleted, Ibrahim is born 05.03.1987, Ayodele is born 02.07.1989 and Chiemeka is born 02.05.1985. However, according to MTN Football, Ibrahim is born 13.05.1990, Ayodele is born 02.12.1988 and Chiemeka is born 02.05.1987. * Gbemi Akinrolabu, the left-winger, has apparently left Sunshine Stars FC. According to MTN Football, Akinrolabu is born 18.09.1990. Interestingly, Akinrolabu was described as “experienced” in an article found on AllAfrica from 2005. At the time, Akinrolabu was playing for Nigerian Ports Authority FC at top level of Nigerian football. * Striker Daudu Alilu Eboh played for Al-Koroum in Egypt before joining Sunshine Stars FC. Egyptian website Filgoal informs that Eboh is born 25.01.1983, not 25.12.1990 as found at MTN Football. I was surprised to read the presentation of Sunday as I was pretty sure he was born in 1990 or 1991 and not 15.07.1987 as found at MTN Football. I was also surprised to see the player being presented as a striker as I am pretty sure that Sunday is a central midfielder. I wrote that Oboabona was most likely born between 1987 and 1989. However, MTN Football writes that he is born 16.08.1990. * It was very interesting to read the birthdates of experienced striker Ibrahim Babale (born 22.04.1984), defensive midfielder Moses James (born 07.08.1990), bulldozer striker Dele Olorundare (born 01.12.1990) and right-back Ofem Inah (born 14.02.1990). All players are well-known in local Nigerian football and I have no documentation suggesting these birthdates are wrong. * On 16.07.2011, Sunshine Stars FC won 2-0 against DC Motema Pembe in their first group match in the Orange CAF Confederations Cup 2011. Youngster Dayo Ojo and red-hot top scorer Ajani Ibrahim scored the goals for the impressive Nigerian side. The picture of Ajani is taken from MTN Football.